The brick electric BBQ at Raglan Holiday Park is perfect for those easy camping evening meals. Our courtyard with picnic tables scattered is free for all guests to use and is conveniently located right beside the kitchen. Raglan Holiday Park guests will enjoy our huge communal kitchen. With gas stoves, conventional ovens for baking, roasting or grilling plus microwave ovens we have everything you need to create your next culinary masterpiece. Relax after your evening meal of freshly caught fish with a game of pool or table tennis; watch some TV or just chill out on a couch with a book. Our backpacker and camping guests love this area! With hot water on demand, a long hot shower can soothe away your tired body after a day of fishing, surfing or swimming at Raglan beach. Keeping on top of your laundry is a breeze here at our Raglan camping accommodation with our token operated washing machines. Keep it simple. 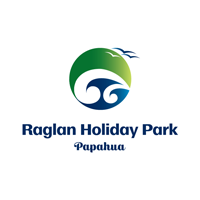 Hire your linen from Raglan Holiday Park and you won’t have a pile of dirty laundry to do when you get home – now that’s a real holiday, a Raglan holiday! Your kids will LOVE the playground here at Raglan Holiday Park – they can swing, climb, trampoline, bounce all day on our huge bouncy pillow and slide ‘til their hearts’ content while you relax. Enjoy free WIFI when you book direct with us. Daily data limits apply.